I started purging (my house), and I can’t stop! It started with going through big sister’s clothes for a future niece, and then it expanded to look at little brother’s clothes. After rummaging through big sister’s big closet, I filled these bags and bins to pass along to four sweet, little babies. ALL this stuff to find a new home with sweet little babies! My son is playing on the couch behind everything (and yes, he does have pants on)! I am so happy to be able to share and pass along our stuff to the next round of babies, knowing that friends and family were so generous to do the same for my two kids. It is so fun seeing my favorite outfits on another little kiddo – a small trip down memory lane! I also had the same reaction that Daddy O. had, “WHAT?! We had ALL of this saved? !” I have saved one small bin of clothes for my kids, but again, I would much rather share the clothes and gear with another family than just keep it stored-up, not being used. From the clothes, I moved on to gear. Infant bathtub, the dreaded diaper champ (so glad to be rid of you), bouncer, jump-aroo, high chair, diaper changing pad, blankets, bottles…the list goes on and on! 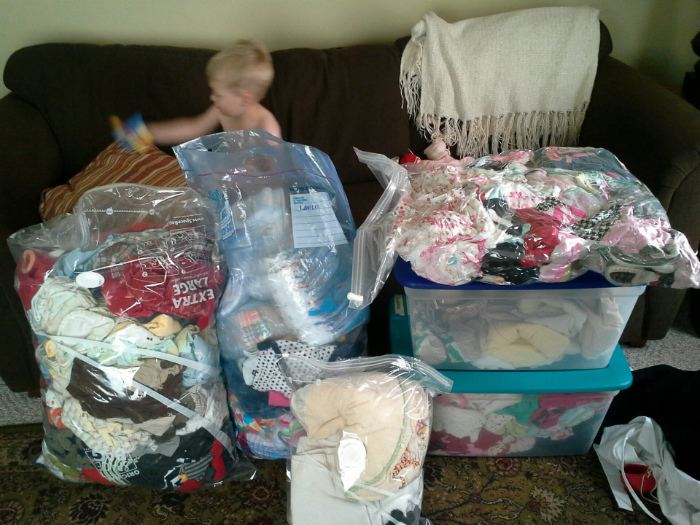 Through our church, I discovered an organization for single moms that actively seeks such baby clothing and items. SCORE! I loaded up my 3 year old son along with all the gear and drove it to the donation center this week. On the way my son said, “I call this baby stuff junk. What is all this junk?” I just laughed, saying, “hey you used this junk when you were a baby!” But in a way yes, it is crazy how much we accumulated and used for our two kids. I hope the “junk” is useful and helpful to other families who need it! There are still a few items for which I’m to find a place, but on the whole, our baby gear has been purged! I thought I would be more emotional, but the practical side of me is over-ruling. The gear is simply stuff (or junk according to my son). I have a sentimental scrapbook and many fond memories forever in my heart of my two babies. My babies aren’t babies, and they’re eager to remind me of that! Be gone baby gear! I was grateful for your service.